wolves working at a cooperative rope-pulling test. Credit: Rooobert Bayer (Wolf Science Center, Ernstbrunn, Austria). (Phys.org)—A team of researchers from the Wolf Science Center and the Comparative Cognition, Messerli Research Institute, both part of the Medical University of Vienna, has found that packs of wolves behave more cooperatively among themselves than do groups of dogs. In their paper published in Proceedings of the National Academy of Sciences, the group describes how they tested both groups of animals at their research institute and what they found by doing so. As the researchers note, the consensus among scientists is that dogs are more social than wolves because they have been bred over multiple generations to be social with humans. But do those social skills apply to cooperation with other dogs? That was the question that motivated the researchers to set up an experiment to compare the two groups in a contrived social setting. 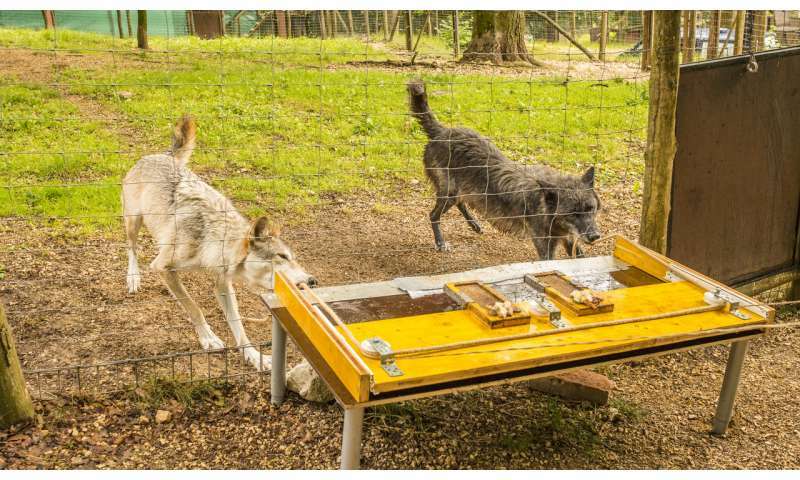 To test the degree of cooperation of members of a wolf pack or group of dogs, the researchers set up an apparatus that allowed two animals to work together to gain access to a food reward. To obtain a bowl of food, both animals had to tug on separate ropes at the same time—in short, they had to cooperate for the benefit of both. The researchers ran the experiment hundreds of times with multiple pairs of dogs and wolves and then tallied the results. They found that dogs were not good at cooperating to gain a meal—out of 472 tries, the dogs succeeded in getting their reward just two times. The wolves, on the other hand, were much better, getting their reward 100 times out of 416 tries. The researchers noted that the wolves did best when paired with familiar partners that also held the same "rank" in the pack. In watching how the animals went about their task, the researchers found that the wolves were much more willing to approach the food bowl together, rather than one waiting for the other. With dogs, the researchers note, the one that is dominant usually goes first, otherwise fighting erupts. The researchers suggest that by approaching the bowl together, the wolves were able to see more clearly what needed to be done to get their food reward. The researchers suggest that while dogs have clearly learned to be more social and cooperative with humans over the years, they appear to be less so with other dogs. A number of domestication hypotheses suggest that dogs have acquired a more tolerant temperament than wolves, promoting cooperative interactions with humans and conspecifics. This selection process has been proposed to resemble the one responsible for our own greater cooperative inclinations in comparison with our closest living relatives. However, the socioecology of wolves and dogs, with the former relying more heavily on cooperative activities, predicts that at least with conspecifics, wolves should cooperate better than dogs. Here we tested similarly raised wolves and dogs in a cooperative string-pulling task with conspecifics and found that wolves outperformed dogs, despite comparable levels of interest in the task. Whereas wolves coordinated their actions so as to simultaneously pull the rope ends, leading to success, dogs pulled the ropes in alternate moments, thereby never succeeding. Indeed in dog dyads it was also less likely that both members simultaneously engaged in other manipulative behaviors on the apparatus. Different conflict-management strategies are likely responsible for these results, with dogs' avoidance of potential competition over the apparatus constraining their capacity to coordinate actions. Wolves, in contrast, did not hesitate to manipulate the ropes simultaneously, and once cooperation was initiated, rapidly learned to coordinate in more complex conditions as well. Social dynamics (rank and affiliation) played a key role in success rates. Results call those domestication hypotheses that suggest dogs evolved greater cooperative inclinations into question, and rather support the idea that dogs' and wolves' different social ecologies played a role in affecting their capacity for conspecific cooperation and communication. Imagine that... a pack animal works together better than a pet that's had it's instinctive behaviors bread out of it over centuries? I, for one, am shocked! Of course, they are less cooperative their job is to cooperate with the humans in their family. It wouldn't be good to cooperate with a dog who belongs an enemy of your human. It is a good way to die. Dogs aren't supposed to be problem solvers either. It makes sense when a dog has a problem to get his human to solve it for him. Were the dogs wild or from homes? If from homes, cooperating with other dogs is not what they have been taught/conditioned to do and I think breeding has nothing to do with it. In this experiment, I do not think they controlled for that factor.